If you are planning to build a garage or car port on your home it can be done more quickly through modular construction. Renovation projects using the modular building process means a faster completion time and a notable reduction in construction costs. This is why any home addition can be utilized and enjoyed more when homeowners choose modular home additions. A modular garage can be constructed with less work on-site. The modules are built in a factory setting and transported to your home when they are ready for assembly, less mess and disruption takes place at your home. Additionally, aside from the basic features, modular garages are delivered and attached to your home with full wiring, outlets and insulation. This means the home project is completed and can be used at maximum efficiency and convenience in no time. Layout and space for modular garages can be further modified according to the needs of the homeowner. There are limitless possibilities for style and layout since modular building systems use new construction technology for customization. Lastly, the floor plan and features decided upon during the planning stage are stringently followed. To learn more about modular home additions and modular garages, contact Tidewater Custom Modular Homes. With busy and often stressful daily work routines, would't it be nice to come home to a vacation everyday? Vacation style modular homes are a great home design for a relaxing atmosphere where you can de-stress every day. For sophisticated homeowners, who are fond of over-sized glass windows, high ceilings, and other eye-catching features that create tranquil ambiance, Cypress Creek vacation style modular homes are the perfect home style. Designed to provide a panoramic view of the outdoor scenery, you can have a furlough anytime in the comforts of your home. In addition to the great views, these homes have an exceptional exterior design and stunning rear elevation. This unique home style can bring in the outdoors to help you relax and unwind everyday. The Cypress Creek modular floor planincludes a spacious kitchen and large rooms with cathedral ceilings. With three large bedrooms and 2.5 bathrooms, your family will be comfortable with the space they need to unwind. The master bedroom has a secluded patio deck that is a perfect spot for reading and relaxing. 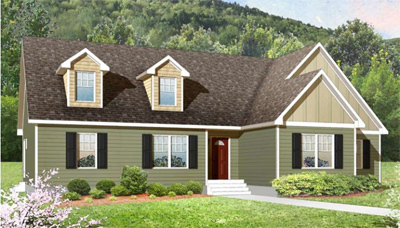 To learn more about this unique modular home design, contact Tidewater Custom Modular Homes. For a variety of reasons, many home buyers now choose modular construction. We're fielding an increasing volume of inquiries concerning financing, assessment, and insuring modular homes. We gladly consult new home buyers contemplating modular homes and gladly assist with your chosen lending agency who will finance all types of modular building systems. Banks are quick to finance modular homes for many reasons which include the fast building process. In terms of home assessment, the appraisal of modular homes in Suffolk, VA are comparable to stick built homes. As a matter of fact, they usually sell at the same price. Modular homes are built with similar building standard as conventional built homes. There are instances wherein insurance companies consider modular home's higher structural integrity which lead them to insure these homes in much lower rate. To learn more information about financing and insuring of modular homes, contact Tidewater Custom Modular Homes. When children move out from their parent's homes, empty nesters often contemplate downsizing. The house upkeep for a large house ultimately becomes a physical challenge and the major reason that drives downsizing decisions. Smaller homes need not compromise comfort. Modular homes offer smaller home styles that are still fully-equipped with features that can be customized to meet the empty nester's special needs. Custom modular homes allow you to design the modular floor plan. Many people are now considering modular construction because of this reason. Contrary to popular belief, modular homes are not made from cookie cutter designs. With its advanced building technology, modular home technology enables homeowners to layout their homes according to very spoecific personal preferences. Our modular homes solutions in Virginia Beach will match exactly to your construction budget without compromising your need. In terms of quality, modular building systems are superior when it comes to raw materials and construction. In each phase of the modular home building process, modules are subjected to quality control inspection that far exceeds stick home construction. To find out more about modular homes, contact Tidewater Custom Modular Homes.